This easy and ultra-satisfying shrimp scampi recipe comes together in twenty minutes and is totally delicious! Packed with lemony, garlic goodness, buttery pasta, and delicious sautéed shrimp; it might just be the perfect meal! I love a shrimp scampi pasta! Buttery, zesty and so satisfying… If you want to add more lemon wine butter and garlic to this recipe I certainly won’t stop you! I enjoy using spaghetti but if you want to sub in your favorite pasta to make linguini shrimp scampi for example then go ahead! If you’d like to try making your own pasta from scratch then click here! What is shrimp scampi made of? 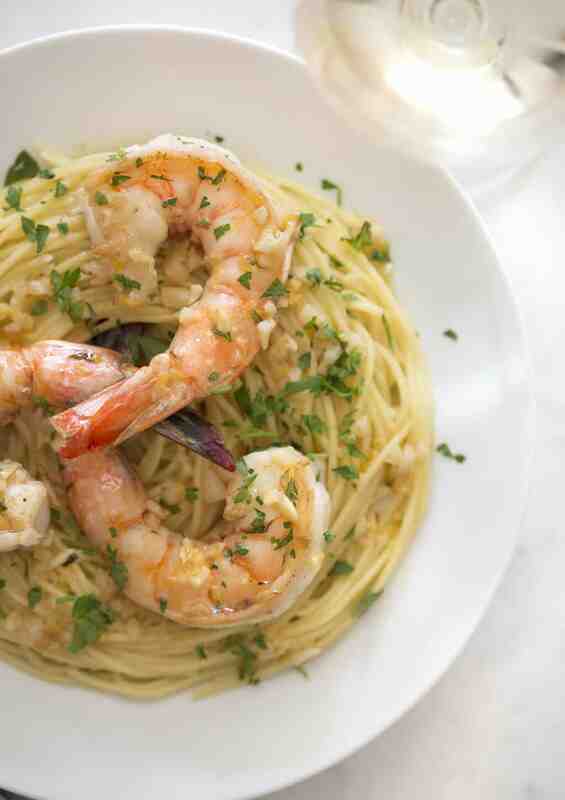 This classic Italian dish consists of shrimp cooked with garlic, butter, white wine and lemon. Although it is most often served with pasta, a big chunk of good bread is a wonderful option to soak up all that sauce. 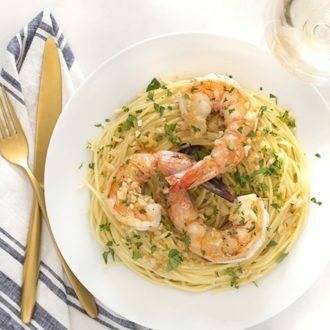 How do you thicken shrimp scampi sauce? Add a tablespoon of so of cornstarch mixed with an equal amount of water to the sauce. Whisk in over heat and cook until thickened. You could instead sift in a few teaspoons of flour, whisk in an cook until sauce thickens up. I bought some super-fresh jumbo shrimp from my local farmer’s market to make this dish and they made all the difference! Don’t use frozen precooked shrimp to make this recipe, the taste and texture will be subpar. Cleaning, or deveining shrimp can seem a bit intimidating so I wanted to go over the process. Start by removing the shell. You can peel it off from the bottom where the little swimmerets are. Once the shell is removed use a small knife to make a roughly 1/4″ deep cut down the top of the shrimp. Now you should be able to see a small vein which you can pull out using your fingers. That’s it! If you’re having difficulty you can cut a bit deeper and use a knife to help remove the “vein” which is actually the shrimp’s digestive tract. 1. Devein the shrimp by making a shallow slit down the middle. 2. Peel the shell off the shrimp starting from where the legs are attached. 3. In a large skillet heat the butter over medium heat. 4. Pour in some olive oil. 5. Add garlic and cook for about a minute, making sure to stir. 6. Add in the lemon juice zest and wine. 7. Throw in the lemon zest, pepper and salt. 8. Simmer until sauce is reduced to half. 9. Add in the shrimp and sauté until pink, about 2-4 minutes. 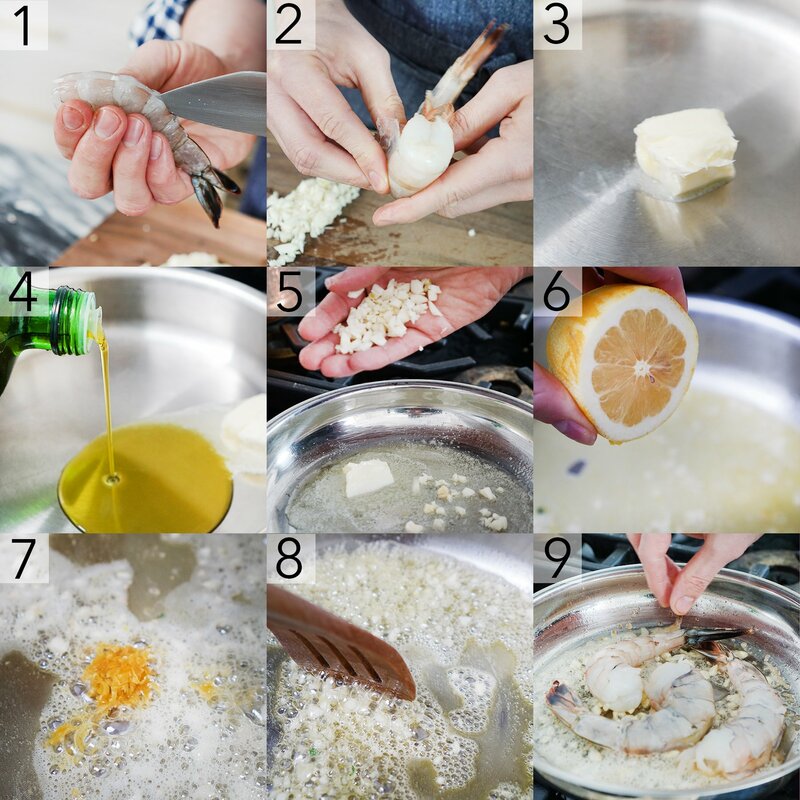 If you’ve tried this scampi then don’t forget to rate the recipe and let me know how you got on in the comments below, I love hearing from you! The Perfect summer dish! Shrimp, garlic, and lemon and a touch of white wine! In a large skillet heat the butter and olive oil over medium heat. Add garlic and cook for about a minute, making sure to stir. Add in the lemon zest, wine, pepper and salt. Simmer until sauce is reduced to half. Add in the shrimp and sauté until pink, about 2-4 minutes. Stir in the lemon juice and parsley. Don't over-cook the shrimp. Just sear each side until that pink color comes out. For best results use fresh shrimp and if you're buying frozen shrimp them make sure they're raw not cooked. You weren’t lying when you say easy!